Dome Records recently revealed the new single from soulful house trio, Tortured Soul. 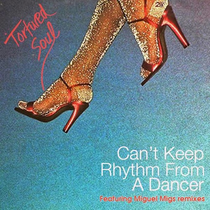 ‘Can’t Keep Rhythm From A Dancer’ has a certain familiar feel to it, sporting all those Tortured Soul credentials and also featured on the package are some tasty mixes from San Fran’s Miguel Migs, who adds a deep, nu disco/boogie vibe to the song. The Brooklyn-based band - lead singer, drummer and songwriter Christian Urich, keyboard player Ethan White and bassist Jordan Scannella - are gearing up for their third album, for release in the autumn. For over a decade now drummer/vocalist John-Christian Urich (Cooly’s Hot Box) bassist JKriv and keyboardist Ethan White (dunnEasy) have been playing their “retro disco meets soulful house” fusion on dance floors around the world. They’ve played in many place, from top clubs such as Fabric, Cargo, and the Jazz Cafe in London to 15,000-plus crowds at the Montreal Jazz Festival, headlining Southport Weekender and have also appeared at the Big Chill festival. From their early singles such as ‘I Might Do Something Wrong’, ‘How’s Your Life’ and ’Fall In Love’ to their albums ‘Introducing’ and ‘Did You Miss Me’, Tortured Soul’s style combines elements of old soul and funk with a modern dancefloor sensibility. In 2010 JKriv departed the band to pursue his own musical adventures and was replaced by Jordan Scannella on bass. Since then the guys have been busy working on some new material, including the single ‘Dirty’. There is a new album of reworkings of Tortured Soul past classics in the pipeline, titled ‘Undercover Soul’, including several new songs. It’s out July 15.